An Interview With Nova's Andrea DiVito and Bruno Hang! The current Nova series has gained a new art team as of Nova #22! 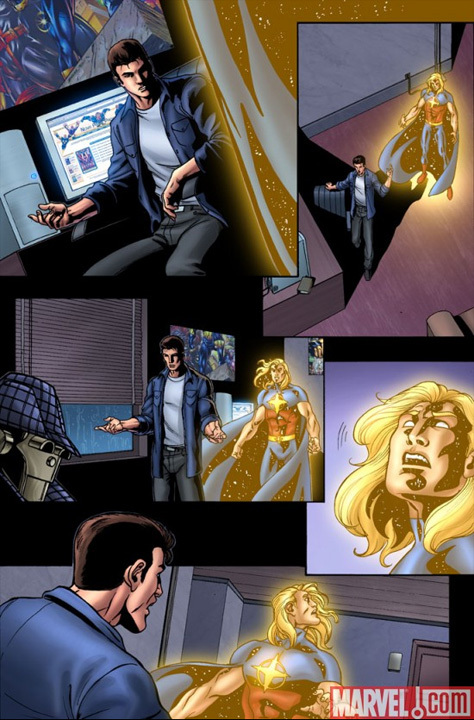 The new penciler and inker is Andrea DiVito. Andrea is returning to the Nova character following the fantastic Annihilation series! Joing DiVito is Bruno Hang, Nova's new colorist! Bruno is a veteran of Spider-Girl, Superman, Wonder Woman and other titles. Andrea and Bruno were very generous and took the time to answer some questions about their arrival on Nova and their art in general! I'd like to thank them for their time and answers! For readers who may be discovering your work for the first time, what is your art background and influences? My biggest influence is without a doubt BIG John Buscema. I grew up reading his Savage Sword of Conan stuff, that's what made me think about penciling for a living. Later in the years I had been able to meet John on a couple of occasions when he came in Italy for conventions. We spent evenings chatting about art and storytelling. He really left a mark on my soul and I miss his work terribly. The world is indeed smaller since he passed on. Hang: First of all, I want to say thank you to all Nova fans who are reading this and also thanks to Doug for all the great stuff on Nova Prime Page. (Ed.- Thanks, Bruno!) I'd like to say that my influences were the great masters of painting or even the comic book legends - of course I was influenced by Will Eisner's story telling, the beautiful Caravaggio's contrast (so impressive) and others - but the truth is that they won't influence me some like some contemporaneous artists like Laura Martin, Alex Sinclair and Morry Hollowell (just for exemple), for the jobs that I'm doing now. Andrea, how do you feel your art has changed since you completed Annihilation? DiVito: I think I'm getting more confident with my inking and figure work. Annihilation has been a blessing and a curse for me. After the first issue it all became a giant blur of extra sized issues and nightmare deadlines:) But I enjoyed every minute of it! Overall, I think that Annihilation had a big part in my professional evolution. No pain no gain, after all! How does inking your own work affect your approach to penciling? DiVito: It was a hindrance at first, now it's a strong plus. The more confidence I gain, the less penciling I make on the actual page. Often I find myself going straight with ink on some panels, whereas before I would be too afraid of not being able to erase my work if it didn't satisfy me. I am also more aware of light and shadow on my figures. Inking has become like sculpting in a way. Thinking of the shape I have to ink using light and darkness brings a very 3d feel to it. Bruno, what tools do you use in your work as a colorist? Hang: I use an Apple iMac as my computer platform, Adobe Photoshop CS4 and Corel Painter IX (mostly for covers) and a Wacom Intuos tablet. How is a look and palette chosen on a project? Is it an editor's decision, your own or a collaboration of both? Hang: In fact it usually come defined on the script. DnA are awesome in the mood definition for each panel, page, whatever, and DiVito really makes the pages' lines vibrant like they've imagined. Then I try to add my vision based on their touches, respecting the line art and the penciler's vision also. Once colored, if everything was right and match with the creator's idea, the editor(s) approve the final version. Andrea, how does it feel to return to work on Nova? I have taken Rich through his worse moments in Annihilation and I felt terribly guilty of not being able to draw his future adventures after all of that. It's nice to see how much the character has developed since the original Annhilation event, he's more fun to draw than ever! How is it working with the rest of Nova's creative team? Hang: Amazing, indeed. We always communicate with each other, telling our ideas, our thoughts. Like I'd said before, Bill (Rosemann) and Mike (Horwitz) give us all the support and they always been there for what we'd need... [Really? Are they reading this? Geez... I hope they keep me on the book for years!] -- Like I was saying, in fact I LOVE to work with the Nova crew! DiVito: Let's put it this way, if you're a Nova fan you should thank the gods that Abnett and Lanning exist. They write AMAZING stories, stuff that makes me itch to draw the next page in the book. And I am not kidding. Bill Rosemann and Mike Horwitz are editing this book like it's their own baby, all of us in the team feel their love for the character and the creative process. The lettering by Cory Petit is simply perfect and fits the story like a glove. Have you always been a Nova fan? Hang: Honestly no... I live in Brazil, have always lived, and the Nova issues weren't published in my country. So in my childhood I just used to see him in other comics as a secondary character. 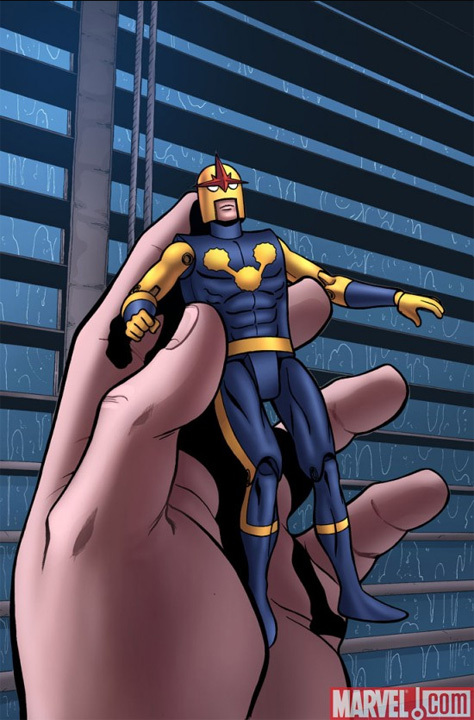 But I've grown up (kinda) and I've started to enjoy Nova adventures and his news by the internet. 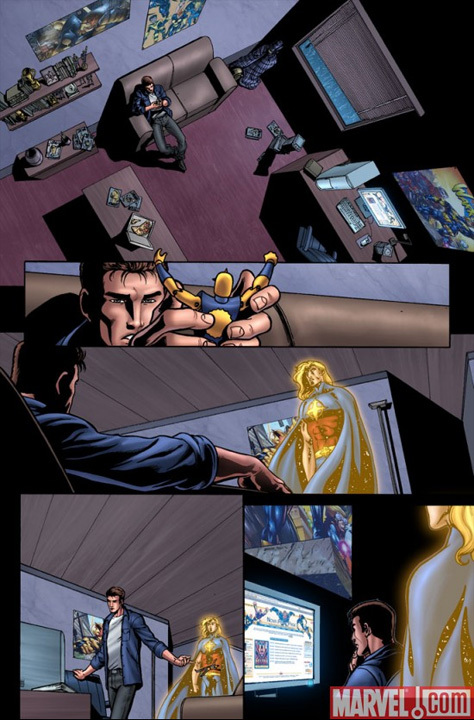 Moments before Annihilation (2006) - at this point I'd already became a colorist and some night (probably in 2007) I really had a dream that I was coloring Nova. Really... Do you believe that? I swear it is all truth... but if someone else had told me... I really would not! Gotta go scratch that itch to draw the next pages! See you in the funnybooks and thanks! Thanks to both of you for the great answers!